The aim of this study was to test the hypothesis whether endurance athletes have distinct expressions of functionally relevant surface antigens of monocytes. Under standardized experimental and laboratory conditions CD14+ blood monocytes of 55 males (22 sedentary controls [CO], individual anaerobic threshold [IAT]: 2.2 ± 1.2 W · kg-1, VO2max: 47 ± 12 ml · min-1 · kg-1; 13 endurance athletes, training: 3 - 10 hours weekly [E1], IAT: 3.0 ± 1.1 W · kg-1, VO2max: 57 ± 5 ml · min-1 · kg-1; 20 endurance athletes training: >10 hours weekly [E2], IAT: 3.7 ± 1.3 W · kg-1, VO2max: 64 ± 6 ml · min-1 · kg-1) were investigated for relative surface receptor expression of CD45, CD64 and HLA-DR (direct immunofluorescence, flow cytometry). E1 and E2 showed significantly (ANOVA, Tukey's HSD test; each p < 0.01) higher relative receptor expressions for CD64 in comparison to CO (E1: + 62/E2: + 71 %; percentage of increase compared to CO value), CD45 (+ 44 /+ 31 %) and HLA-DR (+ 22/+ 35 %). Cell counts off four monocyte subpopulations (CD56+. CD14bright+ CD16+, CD14bright+ CD16dim+, CD14dim+ -CD16bright+) did not show significant differences between the groups. 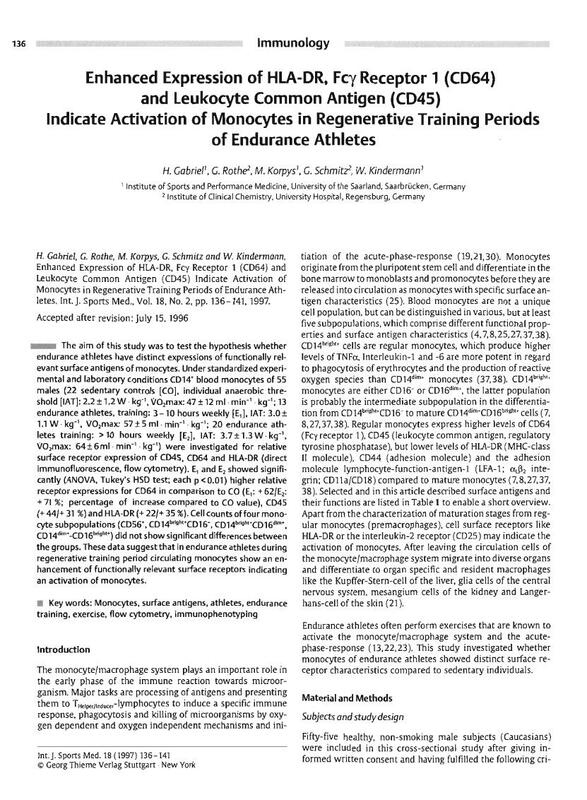 These data suggest that in endurance athletes during regenerative training period circulating monocytes show an enhancement of functionally relevant surface receptors indicating an activation of monocytes.